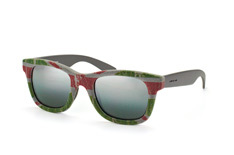 Being independent is the driving ethos behind the Italian eyewear brand Italia Independent. This forward thinking brand creates striking eyewear that challenges convention and proposes that glasses should be created to suit each unique individual. This eye catching collection of Italia Independent at Mister Spex is simply awash with vibrant colour and bold design. The perfect range of accessories for those who enjoy standing out from the crowd, Italia Independent glasses are playful, energetic and distinctive, fusing pattern, form and shade to be daring and different. Finding the right pair of glasses can sometimes be a challenge, but with this lively collection of Italia Independent at Mister Spex, there is more than enough opportunity to get creative with your look. This range of eyewear is perfect for the spring and summer seasons, as their uncompromising designs will work effortlessly with a colourful summer outfit. If you choose a pair of designer glasses by Italia Independent at Mister Spex that don't suit your face or features, you can still return them at your convenience. We offer a hassle free returns process that allows you to return your glasses to us within 30 days, no matter what your reason is for changing your mind.